If you reduce balsamic vinegar into a syrup, you get balsamic glaze: a luscious condiment for drizzling over savory or sweet dishes. If you haven’t had it, we promise: You’ll be converted. With its complex flavors—sweet, sour, fruity—at its simplest use it can enhance anything grilled or roasted, including panini and other grilled sandwiches. It’s also called creme balsamica (balsamic cream). While its origin is in Greek and Italian cuisines, it works with everything from French baked Brie to good old American fried chicken, roasts, chops and grilled fish. Use it for marinating, dressing, or finishing any dish. Drizzle it over grilled meats, fish, and poultry. Serve with aged cheeses like parmesan or fresh ones like creamy goat. It’s a delicious surprise over fruits like strawberries or (our personal favorite) figs wrapped in prosciutto. Use the glaze anywhere you’d use honey as a glaze or seasoning; and with more sophisticated sauces, such as port sauce over beef. Fresh, grilled or poached fruit: berries, pears, stone fruit, etc. It’s easy to make balsamic glaze, and a good idea if you find yourself with too much balsamic on hand. But don’t go out and buy a gallon of the cheapest stuff at a club store. Get something moderately priced: Output = input. Recipe below. But buying it is a time saver. 1. MIX the balsamic vinegar with the sugar in a saucepan over medium heat. Stir constantly until the sugar has dissolved. 2. BRING to a boil, reduce the heat to low and simmer until the glaze is reduced by half, about 20 minutes. The glaze should coat the back of a spoon. 3. COOL and pour into a lidded jar. Store in the fridge. 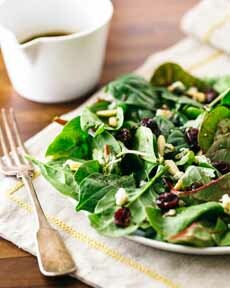 Use balsamic glaze on bitter greens (photo courtesy A Couple Cooks). Glaze your pizza (photo courtesy For The Love Of Cooking). 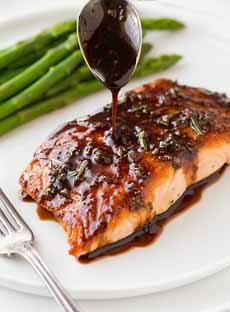 Salmon and other sturdy fish love a balsamic glaze (here’s the recipe from Cooking Classy). 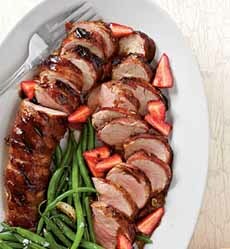 Pork roast with balsamic strawberries (here’s the recipe from Southern Living). *You can substitute agave for lower glycemic; or honey if you prefer it. For a lighter version, substitute apple juice. We love this take on nachos from Half Baked Harvest (photo #5, below). Toasted baguette slices substitute for corn chips, tomato and basil for the salsa, mozzarella for the jack or cheddar cheese. 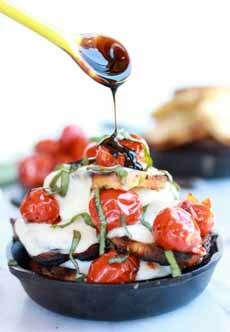 v Mediterranean “nachos”: baguette, tomatoes, mozzarella, olive oil…and balsamic glaze (photo courtesy Half Baked Harvest). Strawberries with balsamic glaze are a classic Italian dessert (photo courtesy DeLallo). 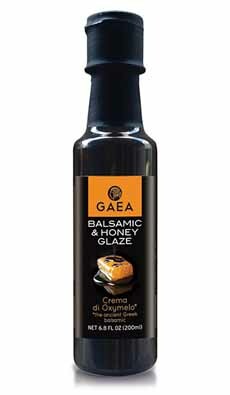 This balsamic glaze from Gaea is made with honey instead of sugar (photo courtesy Gaea). 1. 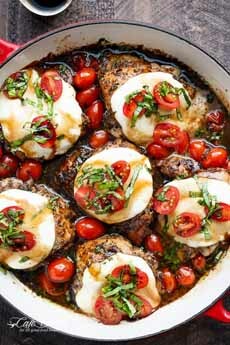 MAKE the balsamic glaze: Add the balsamic vinegar and brown sugar to small sauce pan and simmer until reduced by half. This should take about 10 to 15 minutes. Remove from the heat and set aside until ready to use. 2. PREHEAT the grill to high heat, or preheat the oven to 450°F. 3. ADD the tomatoes to a bowl and toss with 1 teaspoon olive oil, honey, salt and pepper. If the grape tomates are small enough to fit through the gates of the grill, thread them on skewers. Or you can also roast them in the oven for 10 minutes until lightly charred. 4. PLACE the baguette slices on a greased baking sheet and brush each side with a bit of olive oil. Sprinkle the tops with salt and pepper. 5. GRILL the tomatoes for 8 to 10 minutes and the baguette slices for about 3 minutes per side. Or, you can toast the baguette slices in the oven on a baking sheet for about 5 minutes and the tomatoes in the oven for 10 minutes. 6. PREHEAT the broiler to high. 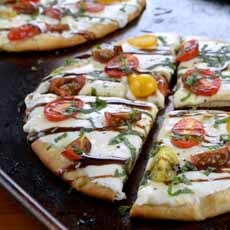 In ove-safe dishes or on a pan or baking sheet, place a few slices of toasted bread, then a few slices of fresh mozzarella and then a handful of tomatoes. Repeat so you make about three layers. Broil for 1 minute or until the cheese is melty. 7. SPRINKLE with the basil and optional chives/scallions. Enjoy hot with a cold beer! It doesn’t get easier than this—or more good-for-you than this dessert from DeLallo (photo #6, above), using their own balsamic glaze. 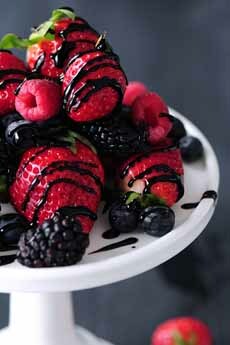 The velvety rich, deep sweetness of balsamic glaze is a classic Italian way to top fresh berries. So simple, but so good. Take it to the next level with a base of gelato, panna cotta or plain Greek yogurt. 1. PLACE the berries in individual serving dishes. If you’re using a base (ice cream, panna cotta, yogurt), add it first. In Greek mythology, Gaia or Gaea (GUY-yuh), from the word for land or earth, is the Mother Earth goddess. Gaia is the ancestral mother of all life. In Greece, Gaea is the mother of all things delicious in olive oil: EVOO, olives isn jars and snack packs, spreads, glazes, vinaigrettes, etc.